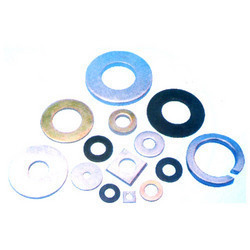 Being a customer-focused organization, we are engaged in offering a wide and exotic assortment of Machine Washers. These are manufactured by the experts using best quality material procured from trusted vendors. The offered machine washers are manufactured in order to meet the diverse requirements of automobile and mechanical industries. Moreover, our machine washers are widely applauded in the market for their high durability and resistance against corrosion. We are leading Distributor and Stockist for all kind of Fasteners, Hardwares, Electrical, Automobile parts and we are specialist in Spring Washers and Cotter Pins. We are also having an ISO 9001:2008 registration and we are also the member of Bombay Bolts Nuts Merchants Association.